Estela's Place takes care of homeless, elderly people and is located in Santa Cruz, Bolivia. It was started by Estela Diez in 1999. After miraculously surviving a car accident, she decided to dedicate her life to helping others and opened a home for people who have no one in their old age. In Santa Cruz, there are very few resources for the elderly and many people end up alone and on the streets, unable to care for themselves. Estela's home provides a safe and loving home for 15 men and women, where they are fed and sheltered and can receive medical attention. Life at Estela's Place is very humble. 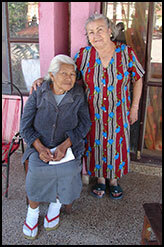 Estela (pictured at right) lives on site and does most of the work herself. This includes all the cooking, cleaning and caring for the physical and medical needs of the residents. All donations help to provide basic necessities such as food, clothing, blankets, medicine and medical treatment.